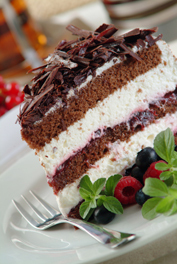 Rays Food Place Bakery & Deli offers a wide array of freshly prepared foods, cakes and party trays. If you've been to a Rays Food Place lately you already know about the high quality choices and great customer service that makes us a great choice for all your ready-to-eat or serve needs. 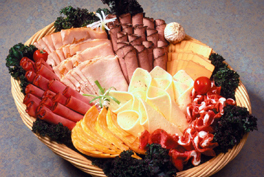 Choose our deli party trays for an office party, wedding reception, graduation, anniversary or birthday. Ray's offers trays to meet your needs, from a 16" deli party tray that feeds 8-10 people, to an 18" tray that feeds 20-22 people. Let Rays Food Place bakery assist in creating the fantasy wedding cake that will be the centerpiece on your special day! Not just for weddings, Rays Food Place can create a cake for any occasion - talk with our local cake designers for more details. 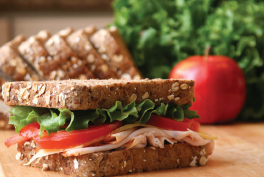 Rays Food Place offers a wide variety of salads, side dishes and sandwiches all made with natural and fresh ingredients for snacks, lunch and dinner. Rays Food Place famous rotisserie chicken is a family favorite. Plus you can start your day with a hot cup of coffee and a delicious donut or cinnamon roll. Your Ray's Deli is proud to offer the quality and commitment to excellence found in Kretschmar deli products. Visit the Kretschmar website to find special offers and recipes for their products. Every day, Gold'n Plump works hard to bring you premium, innovative chicken products that fit the way you live and eat, getting you out of the kitchen in less time and with the all the goodness of homemade. Visit the Gold'n Plump website to find special offers and recipes for their products.